My first MM66 knight. As you can see, I've tried to improve the lance using Empire plastic bits, but the overall look is still... odd. Regarding the colors, I've used the same scheme on the caparison as the one used for Baron Ulrich von Bernau. In MadAlfred's sourcebook on Pfeildorf, Baron Ulrich von Bernau is the commander of Pfeildorf's garrison. As I intend to paint one or two regiments of MM66 models, I've also made him Grand Master of the Söllsguard Knights to lead them to the battle. 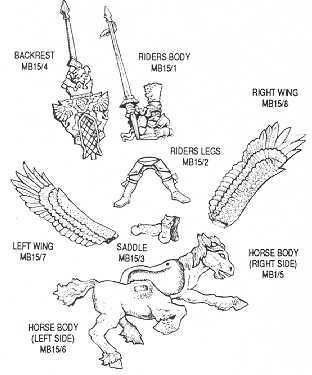 The model is a mix of MM66 (horse and legs) and MB15 (torso) bits. As you can see, they do not fit perfectly, but once painted, I think it works (more or less). Regarding the painting, I have used on the baron the same colors as for the foot knights of the Söllsguard. As for the mount, I've tried a black-and-white caparison. Could have spent more time on it I believe, but I really wanted to finish it before the end of the month. I'm really happy to start painting these damn' MM66 models, their mounts are definitely... eer... expensive? Yes, but also small. Really small. Compare Grand Baroness von Toppenheimer to Baron von Bernau. Who's the boss? More MM66 knights to come next month! Almost done. Took some time to get a decent result, some details still not very convincing, but I'll probably stop here. Same model, different pictures, following the pieces of advice read here and there. In summary, I've changed the colour of the unique horn, touched up the throne, and finished the base. I don't often post unfinished work, but I need a break with this unicorn. Below a few shots, just to let you know where I am, and see what can be improved before I start the rider. Any suggestion welcome at this stage! It's time to paint some heroes! As you may remember, the Sudenland was governed by the Grand Baroness Etelka Toppenheimer until 2515, when she was forced to resign and accept the re-unification of her province with the Wissenland. But the now reduced Baroness of Pfeildorf is still appreciated by her subjects, and whenever required, takes up arms to defend her former province. OK: this is the character I wanted to lead my Pfeildorf's army. 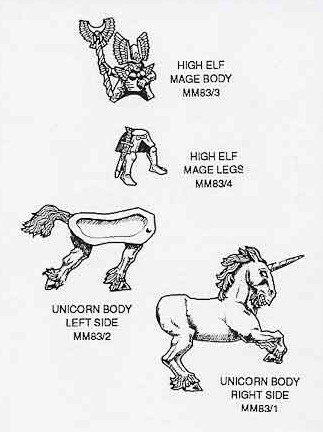 For this general, I had in mind using the massive High-Elf MM83 unicorn. I also wanted to include some spare bits from an uncomplete MB15 imperial pegasus, in particular the saddle and the backrest. The most difficult part was to find a proper rider, the high-elf mage being... well... too elfish for my taste. The range of female warriors being rather limited for Warhammer, I've finally selected a Matriarch from the Mordheim Sisters of Sigmar, and transformed her into a rider by giving her the legs of the plastic Empire/Freeguild General. As you can see below, I've also replaced the initial hammer of the Matriarch by a cavalry lance, which seemed more appropriate for a mounted hero. I've slightly extended the saddle so that this new rider can sit on it, and replaced the missing lance in the back of the backrest by a crowned skull. I still hesitate to add some equipment on each side of the unicorn, but the model is more or less ready for painting.